Coober Pedy – The Opal Capital of the World – must be the most awkward city we’ve ever visited, twice. Woomera must be the second most awkward ‘city’ Situated somewhere in the middle of South Australia, along the Stuart Highway. The humps in white and brown are visible from kilometres before town, the result of the digging for opal. If you intend to walk in the opal fields, be aware of the unfenced shafts! The town developed after the First World War, when returned service men tried their luck and searched for opal, first discovered in 1915. It is a strange city because of the surroundings, an outback town, opal mining, the set of films like Mad Max, and because of the heat in summer a lot of people live and work underground … We didn’t stay in a cave, but we did visit an underground church. You have to visit the place to know the feeling J Off course there are some places where you can visit an opal mine and lots of places to buy some of the precious stone. Another site to visit is the Breakaways. 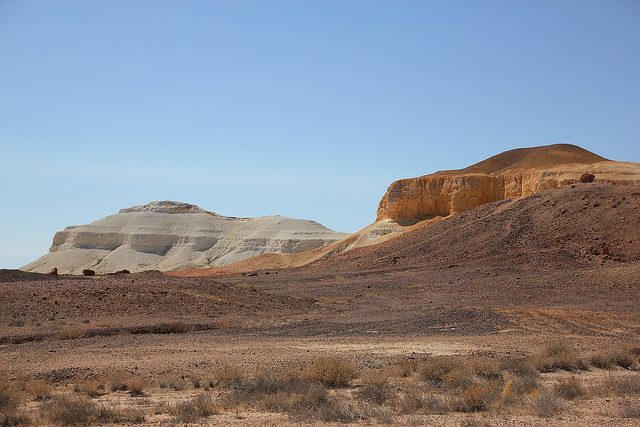 This breathtaking landscape lies about 30 km north of Coober Pedy, and a loop of about 70 km takes you back to town. Before heading there, you’ll have to buy an entrance pass at the visitor centre of the town (2 dollar per person). The Breakaways didn’t steal their name: it consists of hills which have broken away from the Stuart Range. The track takes you through the park, along the colourful hills, formed by erosion (both the colour and the form). There are some lookouts. Please respect the wish of the aboriginal people and do not climb the hills … A remarkable sight is ‘Salt and Pepper’ or ‘The Castle’ or ‘Two Dogs’. For the aboriginal people the hills are two dogs, a brown one and a white one. The hills or called salt and pepper because of their similarity in form, the different colour is caused by erosion and the weather. A bit further is another hill: the man who is the owner of the two dogs. Driving further another extraordinary landscape unfolds: the moon plain. Behind the dog fence there is a vast landscape with … nothing. Absolutely nothing, not a hill nor bush. 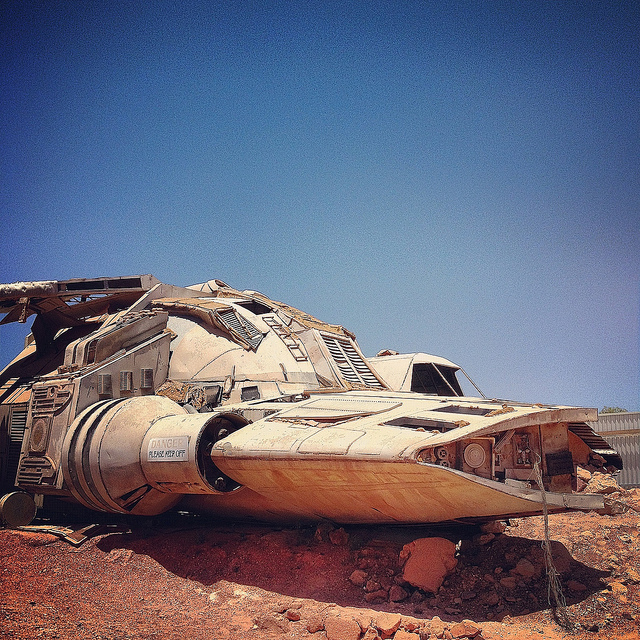 The ideal location for some more filming, like Mad Max. The dog fence is the longest in the world, stretching over 5000 km and 1,8 meters high. Keeping away the dingos to protect the cattle and sheep in South Australia, New South Wales and Queensland.